Your cat’s eyes are sensitive, take care of them for a life of full and healthy vision! Taking care of your cat’s eyes requires attention, diligence, and visits to your vet. However, don’t fret. There are many ways to ensure your cat’s healthy eyesight for many years. Starting with regular visits to the vet, you can do checks to make sure no debris or illnesses have made their way into your cat’s eye or eyelid. Conjunctivitis is when inflammation of the membrane that covers the inner lining of the eye and the white as well. It can be caused by allergies, bacterial infection, fungus, or viruses. In fact, recurrent or chronic conjunctivitis in cats is often the result of the herpes virus, which can return over and over again. 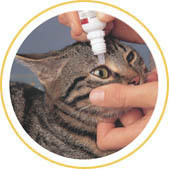 This can be infectious to other cats and humans, so keep infected cats away. Corneal Ulceration can occur when the surface of the eye is scratched or damaged, either as a result from a fight with another cat, personal injury, or more serious, a bacterial or viral infection. Watery Eyes is when your cat constantly cries or “weeps”, or if the fur around them appears to be “stained”; he may suffer from this from an inherited trait, when the tear ducts are malformed and don’t produce normal amounts of tears. Cataracts & Glaucoma, much like humans, can have serious, debilitating eye diseases. Cataracts, which is when vision is hindered by clouding in the eye, is most seen in elderly cats. A thorough evaluation from Dewinton is necessary as surgery is the only treatment. Glaucoma comes from too much pressure on the eye’s interior, which is a result of a decrease in the amount of fluid draining from it. Important: Always administer any medicine to your cat to its full use in order for it to be effective. When administering medication, always stay calm, you cat can sense if you are stressed or nervous, and this will make it more difficult to apply treatment. Praise and reward good behavior with a treat.